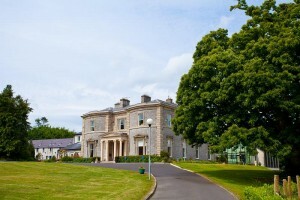 Mount St. Anne’s is set in delightful pastoral landscape, four miles from Monasterevin and ten miles from Portlaoise. Distant views of the Wicklow mountains to the east and the gentle slope of the Slieve Blooms to the south combine with rolling parkland and stately trees to create an atmosphere of serenity in which the spirit is revitalised and energies are restored. This beautiful building was originally the home of the Landlord for the surrounding area, Edward Randal Skeffington-Smyth. The construction of this Georgian Mansion was completed in 1820. The design for the house was elaborate. It is fronted with dressed granite, the entrance consisting of a raised platform of Portland flags, reached by three steps, surrounded by a portico which is supported by pillars crowned by a graceful pediment and flanked by large bay windows on either side. The front hall is imposing with flooring of Portland flags and beautiful moulded ceilings supported with columns of imitation marble. This work was carried out by Italian artisans and by the renowned firm of “Morrisons of London”. In 1823, the Skeffington-Smyth family took up residence in the house and lived here until 1922. The last owner of “Mount Henry”, as it was originally known, was Major Randal Charles Skeffington-Smyth, born in 1864, son of Colonel Edward Skeffington-Smyth who died in 1897. His mother, Letitia, was a daughter of the first Lord Castletown. Major Skeffington-Smyth left for London at the outbreak of the First World War and the house was left in the charge of a caretaker. Around 1919/1920 the famous Dublin physician, Dr Oliver St. John Gogarty, rented the house for one year. In 1922 the house was sold to a Mr Burke for the sum of £1,500. In the late twenties he sold it to the Diocese of Kildare and Leighlin. It became the residence of the Bishop of this diocese, Dr Cullen, who, in turn, sold it to the Presentation Sisters in 1933. The house was then renamed “Mount St. Anne’s” and the Presentation Sisters took up residence on July 26th, Feast of St. Anne, 1933. On January 2nd, 1935 the first novices and postulants arrived and on January 6th Dr Cullen solemnly opened the noviciate and imparted the Papal Blessing to the Community. Work began on the building of a new chapel in 1963 and this was blessed and opened by Bishop Keogh on October 7th, 1964. The house ceased to be a noviciate in 1973 with the establishment of a central noviciate in Co. Limerick. In 1974 Mount St. Anne’s became a “Liturgy Centre” and here many people completed studies of the Theology of Liturgy, The Prayer of the Church, The Eucharist and Sacraments and many other related subjects. In 1978 the Liturgy Centre moved to St. Patrick’s College, Carlow. Mount St. Anne’s then became a Retreat Centre where retreats for students, adults and groups take place. Within the house there are facilities for conferences, workshops, and meetings. The Presentation Sisters welcome individuals and groups, who wish to grow in faith, renew themselves in prayer and search for God’s plan in their lives.